Clean & Green | At The Green House. . .
To be honest, I generally just buy the organic choice if they are available, as I know supporting the organic farmers is a critical step in helping us all get healthier. As organic farmers prosper, prices come down. . . making greener choices more accessible to everyone. Or at least that’s the theory. 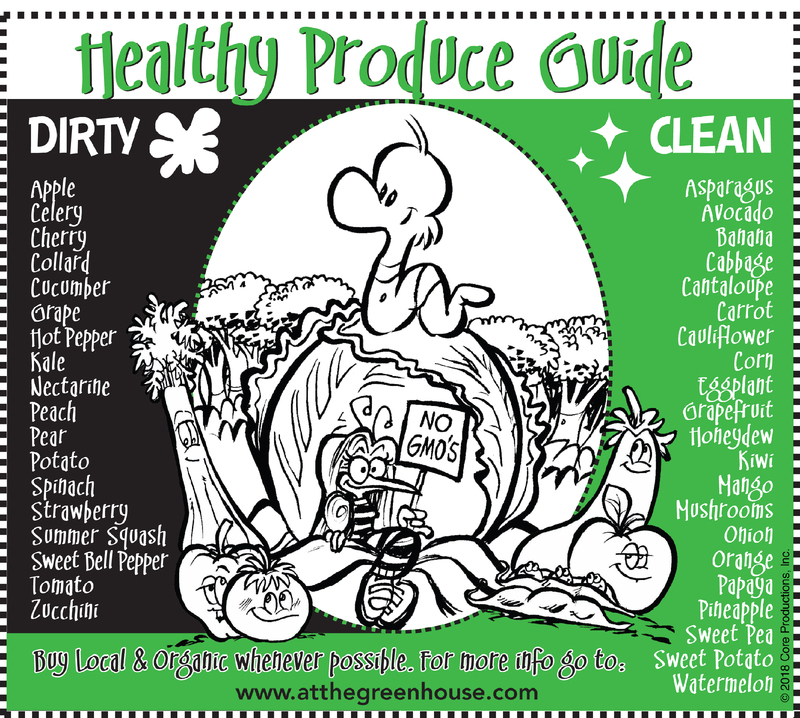 So, this past summer, I read a few updated reports on what is currently considered “clean & dirty” and Peter and I set to work on this graphic, which we hoped to apply to grocery bags, reminder cards, and yes, my cell phone. So, we can take this discussion in many directions. 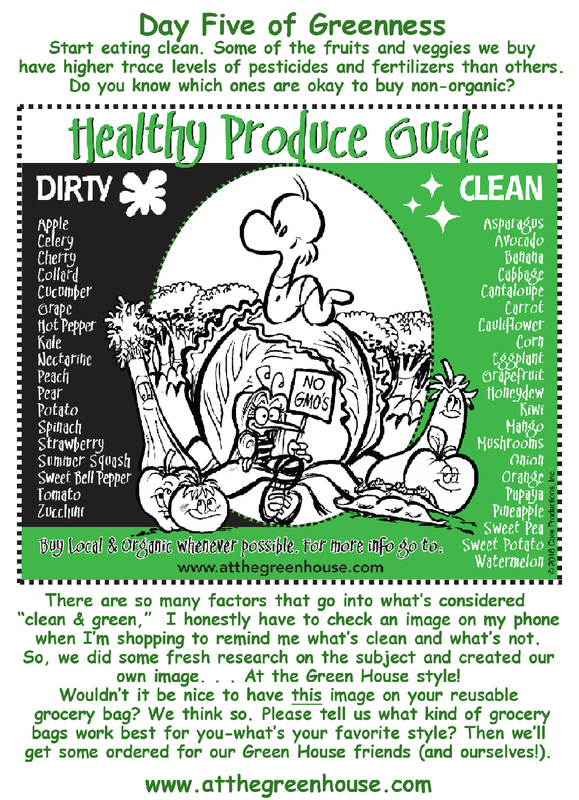 . . you can agree or challenge us on what you consider to be clean or dirty ( produce wise, please) or you can help us decide what kind of reusable grocery bags to print this on. I’ve found some “plastic-y” types of bags that are made from recycled bottles that I kind of like. They stand up pretty well. are water proof. . . and they have that neat little stiff bottom support. That was my first choice. Then I heard from my wife that she’d prefer to have a new insulated bag. That makes sense too. I also have a friend who loves the floppy cotton type of bag because they are washable and she loves the handles. Or would you just like to get a card that you can put in with your grocery bags to remind you. . . or maybe a t-shirt to wear when you go shopping? . . . Too many options? Agreed. Thats’s why we don’t want to have to make this decision alone. In the next few weeks we’re going to order some bags- and we’re going to use them in our campaigns to bring new readers to At the Green House. We’d love it if you’d give us your thoughts and opinions during this process. You can comment here, or on Facebook or Instagram. . . maybe even that Twit thing. . .
Just feel free to tell us what you think. We’re going to be giving away a few of these as soon as we get them printed, so make sure we know you’re interested somehow.